In the Battle of Tarawa (November 20-23, 1943) during World War II (1939-45), the U.S. began its Central Pacific Campaign against Japan by seizing the heavily fortified, Japanese-held island of Betio in the Tarawa Atoll in the Gilbert Islands. 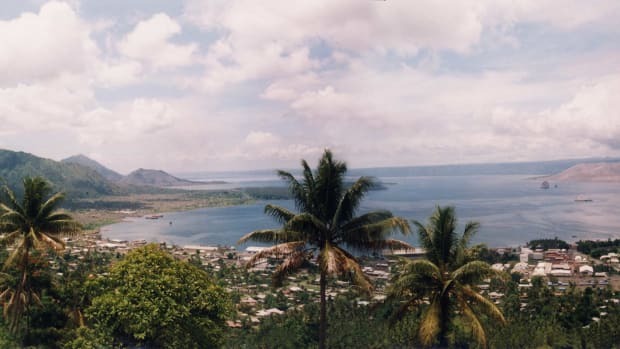 The 18,000 U.S. Marines sent to tiny Betio were expected to easily secure it; however, problems quickly arose. 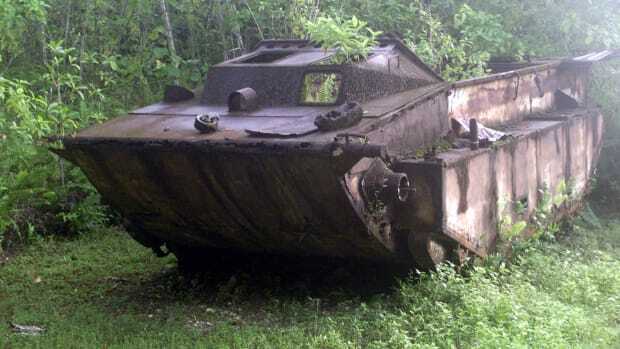 Low tides prevented some U.S. landing crafts from clearing the coral reefs that ringed the island. 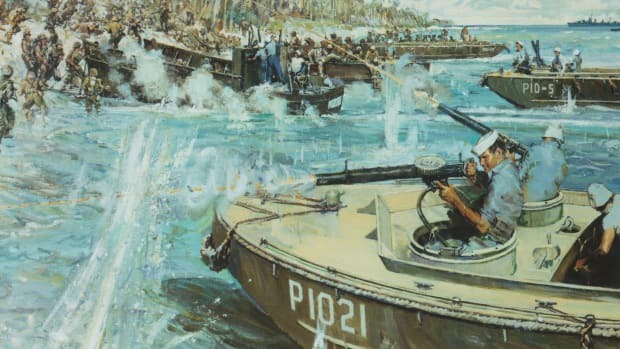 Japanese coastal guns pounded the snagged vessels and desperate Marines gave up on freeing the boats and instead waded toward shore–hundreds of yards away– through chest-deep water amidst enemy fire. Despite heavy resistance from the 4,500 Japanese troops dug in on Betio, the Marines finally took the island after a bloody, 76-hour battle in which both sides suffered heavy casualties. After entering World War II in December 1941 following the Japanese attack on Pearl Harbor, Hawaii, the U.S. began to halt Japan’s aggressive expansion in the Pacific with important battle victories at Midway Island (June 1942) and Guadalcanal (August 1942-February 1943) in the South Pacific. American commanders next set their sights on an island-hopping campaign across the central Pacific. They intended to take the Marshall Islands followed by the Mariana Islands, then advance on Japan. Did you know? In the 76-hour Battle of Tarawa, U.S. Marines suffered almost as many killed-in-action casualties as U.S. troops suffered in the six-month campaign at Guadalcanal Island. The Gilbert Islands, a group of 16 atolls near the equator, were viewed by the U.S. as a stepping stone to the Marshalls and became the first target of the Central Pacific Campaign. In November 1943, the U.S. launched an offensive code-named Operation Galvanic, in which the prime target was the tiny island of Betio in the Tarawa Atoll in the Gilbert Islands. (As part of Operation Galvanic, the U.S. would also send a smaller force to the Gilberts’ Makin Atoll, some 100 miles north of Tarawa. 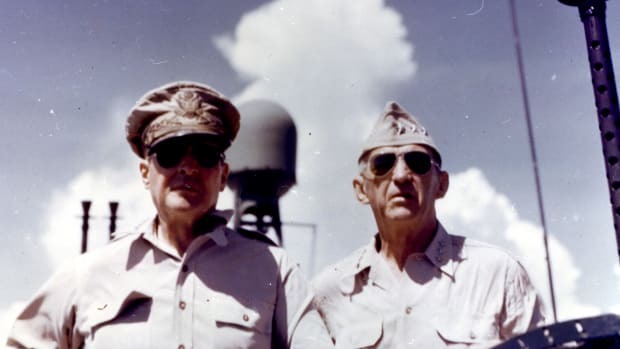 Compared with the taking of Tarawa, the U.S. faced far less Japanese resistance at Makin and the Americans secured the atoll by November 23, 1943.) In late December 1941, Tarawa, a coral atoll located some 2,500 miles southwest of Hawaii, had been seized by the Japanese, who heavily fortified Betio, Tarawa’s largest island. By November 19, 1943, American warships had arrived near Tarawa. 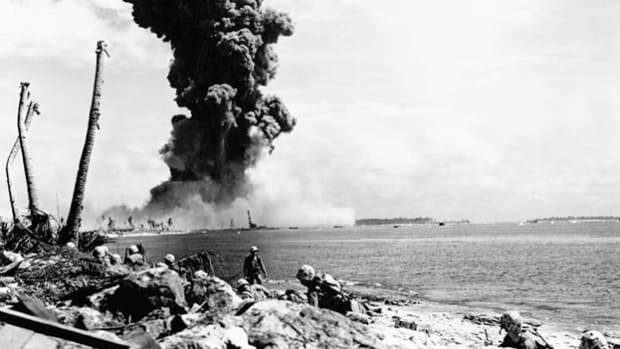 Naval and air bombardments were planned for the next morning with the goal of weakening Japan’s defenses and clearing the way for 18,000 U.S. Marines to seize the island. However, the taking of Tarawa would prove to be more difficult than the Americans had anticipated. 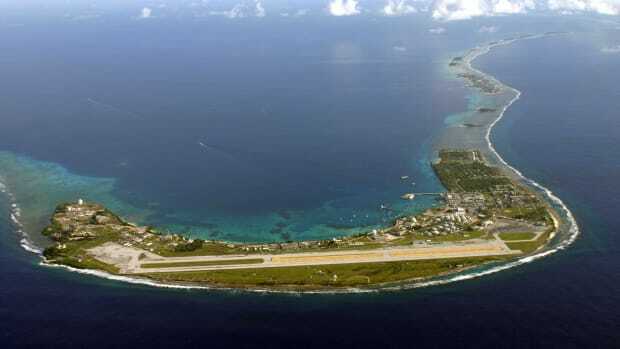 Tarawa was the most fortified atoll America would invade during the Pacific Campaign. Japanese Admiral Keiji Shibasaki (1894-1943), confident in his command, reportedly bragged that the U.S. couldn’t take Tarawa with a million men in 100 years. Measuring around two miles long and a half-mile wide, the island of Betio was crisscrossed with defenses: 100 pillboxes (dug-in concrete bunkers), seawalls, an extensive trench system for defensive movements and an airstrip were supported by coastal guns, antiaircraft guns, heavy and light machine guns and light tanks. 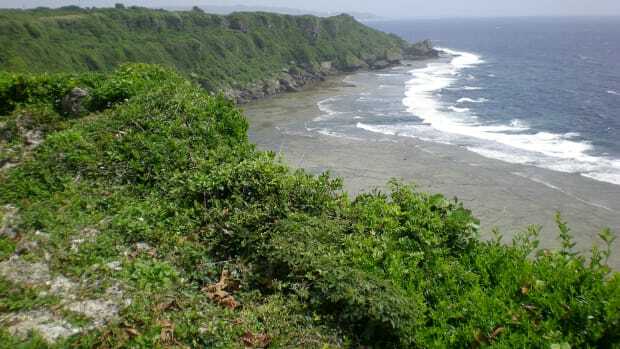 Betio’s beaches were naturally ringed with shallow reefs, which were covered with barbed wire and mines. The Japanese garrison at Betio was defended by at least 4,500 troops. The U.S. fleet of warships that arrived at the Tarawa Atoll on November 19, 1943, included battleships, aircraft carriers, cruisers, destroyers and a huge supply fleet, all supporting 18,000 Marines. 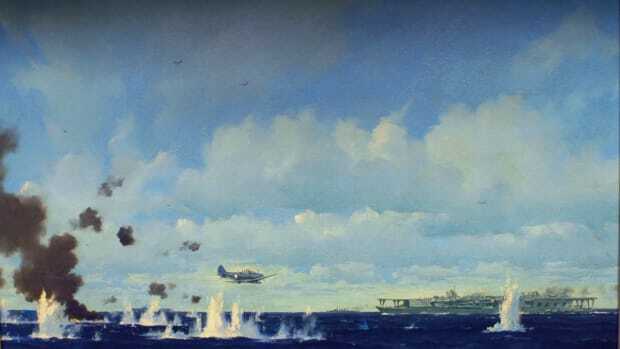 The attack would be a monumental effort of combined arms coordination in a new war tactic, dubbed “Atoll War,” which relied upon heavy pre-invasion bombardment by battleships and carrier planes. Marines were to approach the shore in new amphibious tractor vehicles dubbed amphtracs. These landing crafts, armed with machine guns and carrying 20 troops each, were able to crawl over shallow reefs and other barriers. Compounding these problems was a lower-than-anticipated tide level around the island that morning. Most amphtracs in the first assault wave were able to reach the beach as planned, but nearly all the larger, heavier landing crafts behind them jammed into coral reefs exposed by the shallow tide. Marines were forced to abandon their landing crafts and wade through chest-deep water amidst enemy fire. Precious gear, especially radios, became soaked and useless. Many Marines were hit in the open water, and those who made it to shore arrived exhausted or wounded, ill-equipped and unable to communicate with supporting forces. 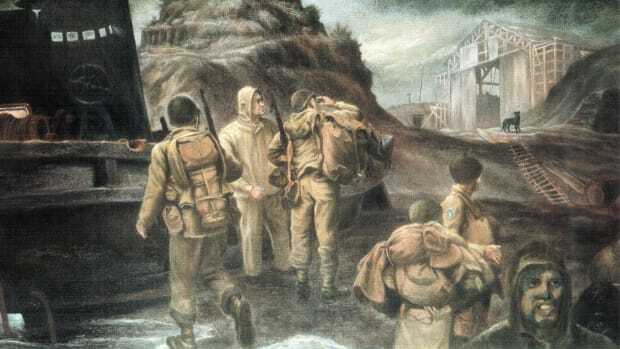 Making matters worse, the assault path through the lagoon to the shore became congested with disabled landing crafts and bloodied bodies, which hindered the dispatching of reinforcements. Marines on the beach crawled forward, inch by inch, knowing that to stand or even rise slightly made them easy targets. By the end of the first day, 5,000 Marines had landed at Betio while at least another 1,500 had perished in the process. On day three of the battle, November 22, the Marines fought on, destroying several Japanese pillboxes and fortifications. That night, the last Japanese defenders of Betio launched a furious but futile banzai charge, or all-out, suicidal attack. Most Japanese soldiers fought to their death rather than surrender. At morning light on November 23, the defenders lay in tangled heaps: All but 17 Japanese soldiers had died defending Betio. Seventy-six hours after the invasion began, Betio was finally declared secure. More than 1,000 U.S. troops were killed in action and some 2,000 were wounded in only three days of fighting at Tarawa. 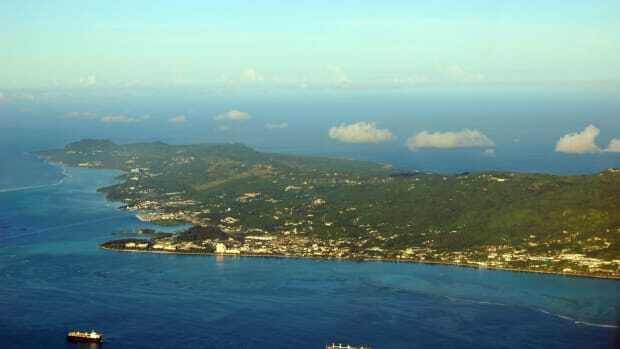 Word of the heavy casualties soon reached the U.S. and the public was stunned by the number of American lives lost in taking the tiny island. However, according to “The Pacific War” by John Costello, U.S. commanders learned important lessons from the Battle of Tarawa that would be applied to future atoll wars, including the need for better reconnaissance, more precise and sustained pre-landing bombardment, additional amphibious landing vehicles and improved equipment: Among other advancements, better-waterproofed radios would be developed.